Taking shelter in a cafe in Fort William while rain and hail lashed the windows, lightening illuminated the sky and thunder echoed, we spotted a break in the bleak weather forecast which coincided with the CalMac ferry timetable to Rum. Perfect, we would traverse the Rum Cuillins. After catching the morning ferry from Mallaig, we were on our way by 12.30pm. Little did we know that 12 hours later we’d be eating our dinner! We started off following the Allt Slugan a’ Choilich towards Coire Dubh making adjustments to our packs to try and carry the load most efficiently. 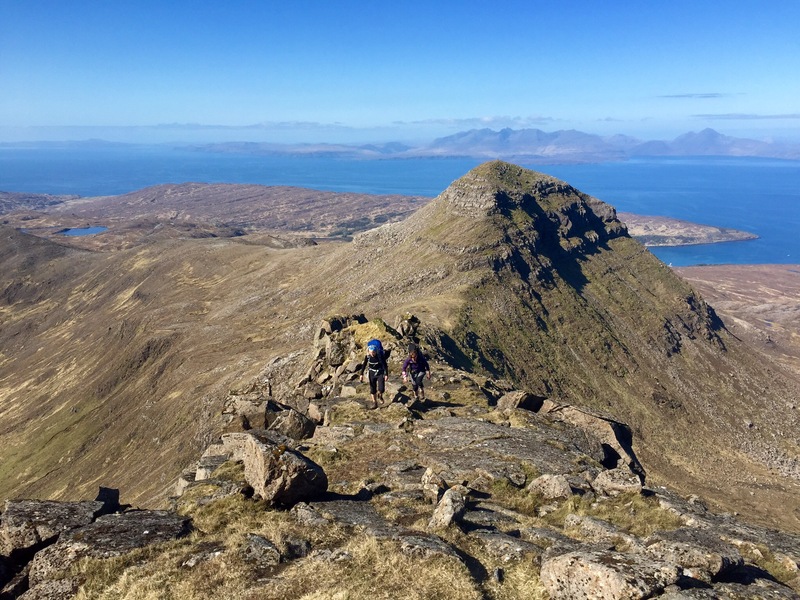 After picking our way down Hallival’s rocky slopes, we started the ascent of Askival towards the menacing Pinnacle. We all decided to give the harder right hand side a go but soon in, two decided it wasn’t for them and headed round the left hand side. Julie and I continued with the harder scramble which had one move in particular which was slightly tricky with the heavy packs on. We lost a lot of height descending to the Bealach an Oir before re-ascending to Trollabhal. We left our packs on the first top and it was a much quicker and easier scramble up to the second top without the weight. We’d read about the importance of taking the right line off Trollabhal (SSE) to avoid the big slabs/crags but route finding was still difficult, despite perfect visibility. Ainshval was fairly straightforward. We started going up the right hand grassy side of the ridge line before skirting over to the left. A short steep hike up through the rocks popped us out almost the summit. We continued on to our last summit, Sgurr nan Gillean, conscious that time was pressing on and my stomach was definitely over energy bars and crying out for some proper food. It would have been nice to camp out but we were out of water. The sun dropped setting behind the Outer Hebrides as we picked our way down the north side of Leac a’ Chaisteil, just before Ruinsival, in the dark. It was a bit of a trudge to Harris where we set up camp, had a very late dinner at 12.30am and woke to an amazing still and sunny morning. This was a great trip but despite the amazing weather, route finding was still a little tricky trying to find the easiest way to descend off the tops so take care when visibility isn’t so good! There’s still some exploring to do on Rum so hopefully I’ll be back soon. 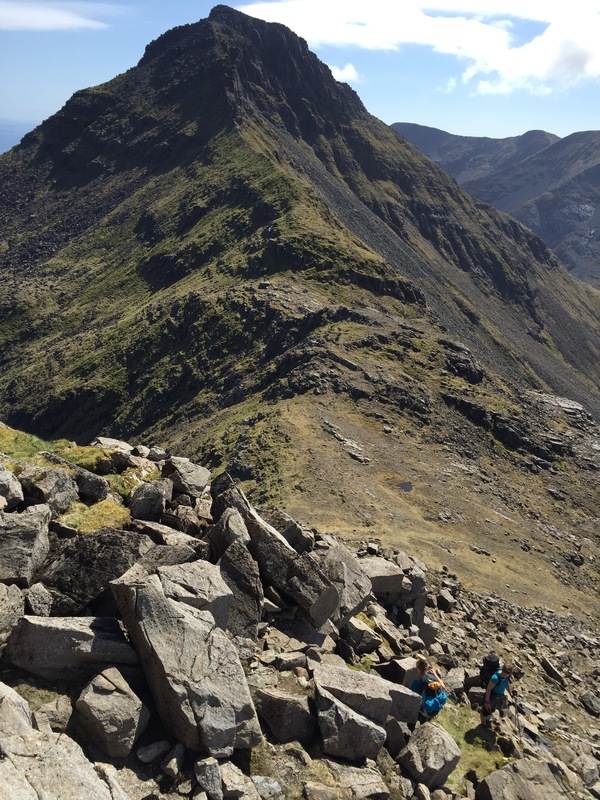 This entry was posted in Outdoors and tagged Hining, Rum, Rum Cuillins, Scotland, Scrambling on 13/09/2015 by Mangoventures.